Dont overlook bright colors in overcast, clear water conditions. This 27 ½-inch fish fell for a Double Bubble DD. In case you are following along, and for those new to the column, I mentioned in my opening article that I’ll be discussing lures and techniques in an ascending manner. Remaining true to form, we explored the middle part of the water column with various jerkbaits and as we progress to the surface, I would be remiss if I didn’t discuss the zone just below the top. Year after year at about this time, anglers start to unveil a seemingly neglected box of topwater plugs. Split ring pliers and fresh hooks often accompany a cold beverage of choice to the serenade of a Spotify playlist on workbenches or boats across the Gulf Coast. Along those same lines, experience on the water during this time of year, proves to us that fish may not be as eager to reward our spirited intent. To help bridge that gap, insert this month’s article. 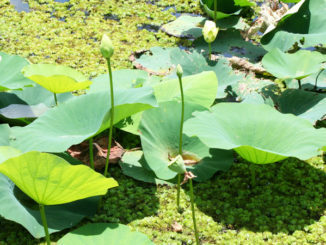 The 6-8 inches of water just below the surface can be extremely productive if fished effectively and with specific purpose. Short strikes and swirls often confirm lack of fish commitment to surface baits, but providing the right lure targeting those mere inches remain invaluable. Three lures I want to discuss to help you fish that part of the water column efficiently is the Borboleta Lele, the Texas Custom Lures MirrOlure Double D and the tried and true MirrOlure 7M. Let’s first talk about the Borboleta Lele’. Produced by a company in the Southeast region of Brazil, Borboleta’s self proclaimed most famous lure is the Lele. Smaller in stature (3 inches) compared to the other two lures, this bait not only produces plenty of bites but big ones as well. Outfitted with No. 4 treble hooks and weighing 3/8 of an ounce, its unique shape provides not only great profile but excellent action. Designed to be twitched down on a steady 2-count cadence, the bait darts downward approximately 8-10” and floats back to the top. 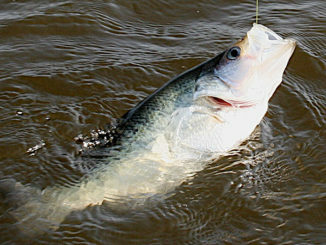 It can be fished on an accelerated walk the dog cadence, but most bites come on the pause as the bait retreats back to the surface. Speaking of floating back to the surface, the Lele is slower than a 7M but faster than the Double D. In other words, if you wanted a smaller profile offering with an exaggerated ascent profile, this bait gives you that capability. The angling world is fortunate that the 7M exists. Decades ago, experienced anglers wouldn’t be caught without the “topwater” capability of this ever so consistent bait, but somewhere along the way we lost our appreciation for this lure’s fishability. On a recent trip with 3-time IGFA World Record Holder for Speckled Trout on fly in various line classes, including the most recent, a 9-pound 2-ounce fish on 2-pound tippet, I asked Doc Jay Wright, “What is your favorite artificial lure to throw when looking for big fish?” Without hesitation, he says “a 7M” then reaches under the gunwale of his Hells Bay flats boat and pulls out a Spinning rod outfitted with a Mullet Color pattern 7M. For those that haven’t fished this bait or know its capability, it’s very similar to the Borboleta Lele, but its ascent rate is very fast. In other words, from the time you stop your twitch cadence, the bait retreats to the surface in less than a half second. Having said that, this bait provides an exceptional offering and perfect solution to connecting with those fish that remain uncommitted to eating a surface plug. Unlike the other two baits, it has three sets of treble hooks, which can be cumbersome, but can be adjusted. As stated, the 7M is the subsurface extension of a topwater since it ascends so quickly, and a great “stand by” option on less committed topwater fish. Newer in terms of packaging and sales, this lure is the most recent to hit the market. 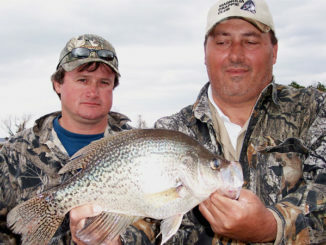 Actually, many anglers outside of Texas have yet to see the Double D, let alone fish it exclusively. 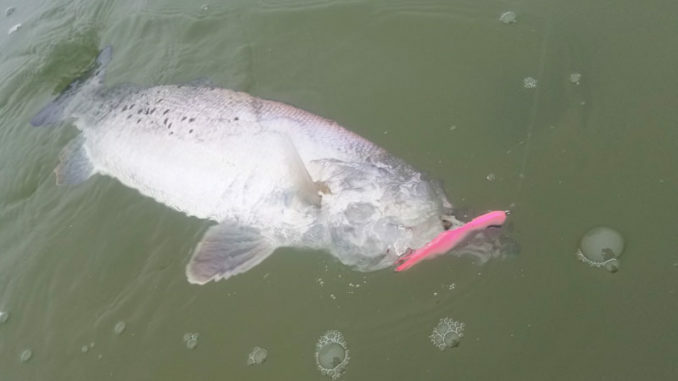 Fortunately, Speckled Truth spans the angling reaches of Virginia to Texas and when I saw and understood this lure’s capability, it was a no brainer before it started producing some large fish. At first glance, people confuse the MirrOlure Double D with a MirrOlure MirrOdine XL (27MR) since its profile is the exact same. Fortunately, the internal mechanism is different and instead of sinking like the 27MR, the Double D floats back to the top after an angler’s twitch cadence. Of the three lures discussed, this lure has the slowest ascent rate as well as dive depth (9-12”). The majority of the bites come on the exaggerated pause, which can be upwards of 3 seconds before surfacing. In other words, this bait is a great cold water offering or when a more pronounced below the surface profile is to be achieved. Having said that, do not be fooled by its slow fishability. Big fish in water temps as cold as 53 degrees have completely engulfed these baits at or near the surface after an exaggerated pause, and they do so with authority. Bottom line, add this lure to compliment your topwater arsenal when fish won’t commit — it’s the easiest decision you’ll ever have to make. So, in a nutshell, below the surface twitch baits provide the perfect hybrid capability for those finicky spring topwater trout. If you haven’t explored these types of baits or their capabilities, I encourage you to do so and don’t forget about those critical inches just below the top — it can pay huge dividends. Until next month — Tight lines, God bless, take what you need and release the rest!